From Goodreads ~ Ten years ago, before he got a job at Esquire magazine and way before he became the etiquette columnist at Entrepreneur magazine, Ross McCammon, editor at an in-flight magazine, was staring out a second-floor window at a parking lot in suburban Dallas wondering if it was five o’clock yet. Everything changed with one phone call from Esquire. Three weeks later, he was working in New York and wondering what the hell had just happened. This is McCammon’s honest, funny and entertaining journey from impostor to authority, a story that begins with periods of debilitating workplace anxiety but leads to rich insights and practical advice from a guy who “made it” but who still remembers what it’s like to feel entirely ill-equipped for professional success. And for life in general, if we’re being completely honest. McCammon points out the workplace for what it is: an often absurd landscape of ego and fear guided by social rules that no one ever talks about. He offers a mix of enlightening and often self-deprecating personal stories about his experience and clear, practical advice on getting the small things right - crucial skills that often go unacknowledged - from shaking a hand to conducting a business meeting in a bar to navigating a work party. Here is an inspirational new way of looking at your job, your career, and success itself; an accessible guide for those of us who are smart, talented, and ambitious but who aren’t well-“leveraged” and don’t quite feel prepared for success ... or know what to do once we’ve made it. 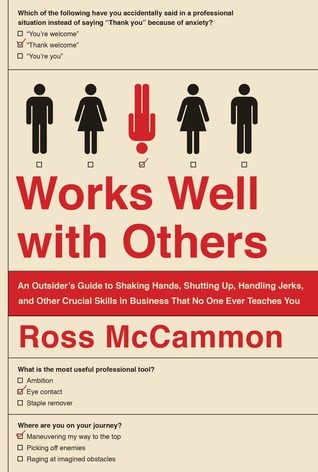 Ross McCammon is an editor at GQ magazine and the business etiquette columnist at Entrepreneur magazine. When he wrote this book, he was a senior editor at Esquire magazine (from 2005 to 2016), where he was responsible for the magazine’s coverage of pop culture, drinking, cars and etiquette. The author starts by telling us a little bit about himself and how he ended up at Esquire. Then he proceeds to tell you everything you need to know to be a professional and to work well with others. This includes how to act in an interview, being the new guy, partying with your colleagues, shaking hands, eye contact, writing an email (short and to the point), behaving in a meeting (no need to give too much information), your social media presence, swearing, handling jerks and pricks and more. I liked the two beer puppy test. I liked the writing style. Rather than being a dry and boring business book, I liked the author's humour. The chapters are short and snappy. I knew most of the things the author covered but it was a good reminder. As a head's up, there is swearing.